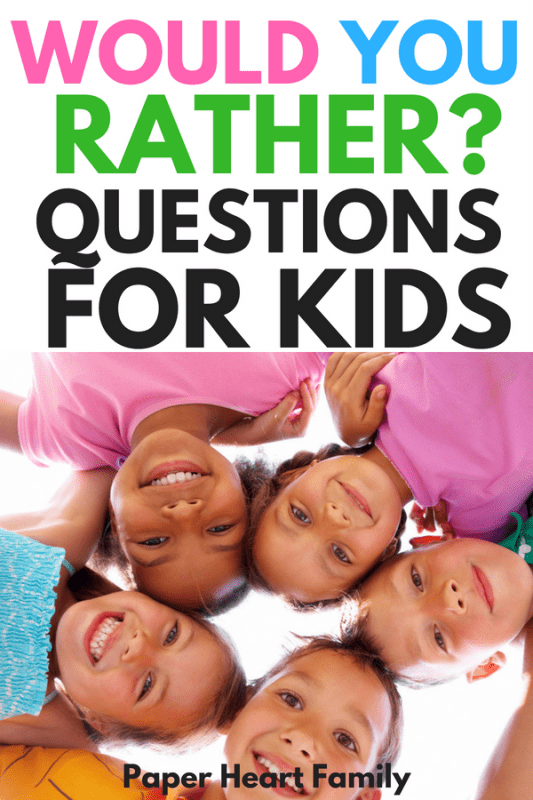 Are you looking for Would you rather questions for kids? You’ve come to the right place! Kids love to be silly, and when you can get in on the fun with them, it’s even better. 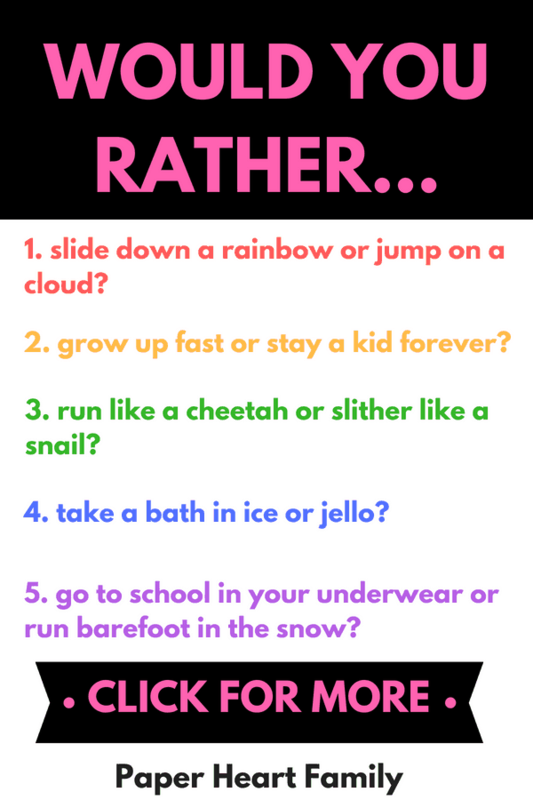 This would you rather questions list is also available in this cute printable, so that you can record your child’s answers, and look back at it and laugh when they are older. 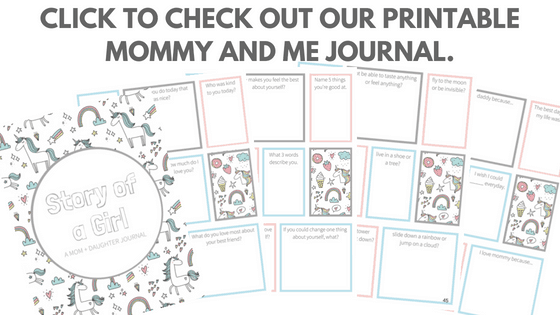 Also, make sure you check out this printable Mommy and Me Journal, which contains these would you rather questions and more to help you get to know your child better. This list is full of silly questions that you can ask your kids, and they are sure to elicit lots of laughs. We like to include this game in our family game night, because it’s always fun to see how everyone in the family answers these questions. 1. Would you rather be silent or still all day long? 2. Would you rather eat the worst food in the world or hear the worst sound in the world? 3. Would you rather live in a house full of cheese or chocolate? 4. Would you rather never eat dessert or never sleep? 5. Would you rather ride a flying bus or ride a unicorn? 6. Would you rather have a monkey’s tail or an elephant’s trunk? 7. Would you rather live in a house made of trampolines or foam pits? 8. Would you rather be as tiny as a fly or as big as a whale? 9. Would you rather live in the clouds or underwater? 10. Would you rather have a million dollars or a million friends? 11. Would you rather sing like a chicken or waddle like a penguin? 12. Would you rather be the smartest person or the funniest? 13. Would you rather be as quiet as a mouse or as loud as a lion? 14. Would you rather have purple skin or a blue tongue? 15. Would you rather not be able to taste anything or feel anything? 16. Would you rather fly to the moon or be invisible? 17. Would you rather find a treasure map or magic beans? 18. Would you rather live in a shoe or a tree? 19. Would you rather have 100 brothers or 100 pets? 20. Would you rather build a tower or knock it down? 21. Would you rather slide down a rainbow or jump on a cloud? 22. Would you rather ride a kangaroo or a frog? 23. Would you rather meet an alien or turn into a mermaid? 24. Would you rather eat weird food or wear weird clothes? 25. Would you rather grow up fast or stay a kid forever? 26. Would you rather be too hot or too cold? 27. Would you rather splash in puddles or mud? 28. Would you rather run like a cheetah or slither like a snail? 29. Would you rather smell like a skunk or have stinky feet? 30. Would you rather have a tail or a horn? 31. Would you rather live by yourself or with 50 people? 32. Would you rather take a bath in ice or jello? 33. Would you rather have a monkey or an octopus as a pet? 34. Would you rather have super hearing or super smelling? 35. Would you rather walk on your hands or roll like a ball to get around? 36. Would you rather go to school in your underwear or run barefoot in the snow? 37. Would you rather be best friends with Anna or Elsa/Kristoff or Sven? 38. Would you rather have really long legs or really long arms? 39. Would you rather go to space or the ocean floor? 40. Would you rather not talk all day or not play all day? 41. Would you rather have wings or a mermaid tail? 42. Would you rather never listen to music or never watch TV? 43. Would you rather have giant ears or giant feet? 44. Would you rather eat 1 chocolate bar now or 10 chocolate bars later? 45. Would you rather talk to animals or travel into the book you’re reading? 46. Would you rather be Sneezy or Sleepy? 47. Would you rather be super strong or super fast? 48. Would you rather it always be summer or always be winter? 49. Would you rather be in a movie or sing for a packed theater? 50. Would you rather eat a stick of butter or a bottle of ketchup? 51. Would you rather only whisper or only shout? 52. Would you rather not celebrate Christmas or not celebrate Halloween? 53. Would you rather be really hairy or have no hair at all? 54. Would you rather always lose or never play? 55. Would you rather be a princess or a superhero? 56. Would you rather smell like a skunk or oink like a pig? 57. Would you rather get a back scratch all day or play all day? 58. Would you rather be able to freeze time or go back in time? 59. Would you rather have a picnic outside or eat at a restaurant? 60. Would you rather it rain glitter or juice? 61. Would you rather be tickled or hugged? 62. Would you rather explore a cave or a tree house? 63. Would you rather know everyone’s secrets or see through walls? 64. Would you rather have 5 friends or 1 best friend? 65.Would you rather be the youngest sibling or the oldest sibling? 66. Would you rather be older or younger? 67. Would you rather live on a farm or live in the city? 68. Would you rather meet Santa or the tooth fairy? 69. Would you rather skate everywhere or hop everywhere? 70. Would you rather have carrot ice cream or broccoli cake? 71. Would you rather hug a porcupine or an octopus? 72. Would you rather always be sleepy or always hungry? 73. Would you rather live in the past or the future? 74. Would you rather have a lot of money or a lot of friends? 75. Would you rather jump in a pile of snow or a pile of leaves? 76. Would you rather live without air conditioning or without heat? Need more laughs? We’ve got the perfect kid-approved jokes! Hope you had a lot of laughs with these would you rather questions!